Calanthe vestita is a type of terrestrial orchid, but sometimes we can find it grow as epiphytes or litophytes. These orchids live in hot to warm habitats. 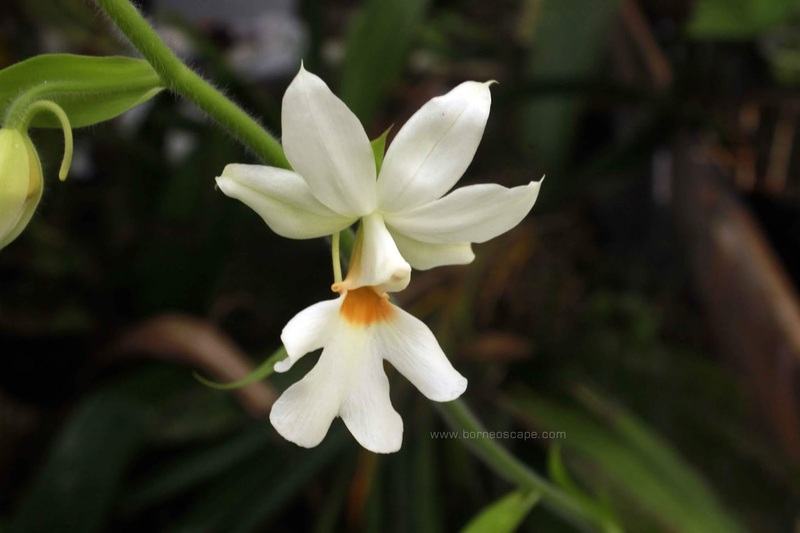 Calanthe vestita is often referred to as the handsome Calanthe. This refers to its name vestita, which means clothed ("dressed"). This name describes the flowering part from the flower stalk until the flower itself is filled with very fine hairs. Recently, it has been known that there are 170 species from the Calanthe genus. Most of the Calanthe species grow as terrestrial orchids and sometimes grow on rocks (lithophyt) and only a small proportion are epiphytic orchids. This orchid plant has a pale grayish pseudobulb that is enlarges at the bottom. Leaves appear from the tip of the pseudobulb, usually it has 4 lea with a number of 4 sheets, lanceolate to oval without fine hair, 40 cm a length and 5 cm width. This pale green leaf is supported by strong and winged leaf stalks. Inflorescence appears between the leaves, at the base of the stalk erect, and ducks at the ends. The length of the flower stalk can reach up to 70 cm in length and can accommodate up to 10-20 flowers. All stems of inflorescence and flower stalks are filled with fine hair. There is a lanceolate bractea (flower sheath), light green, which is also filled with fine hair. Sepal and petal are pure white with lips that have 4 curves, two curves in the middle separated by a gap that is not too deep. The base of the lips is orange just below the gynostemium. On the back of the lips there is also a curved spur (approximately 1.5 cm in length). This orchid tends to blooming in the rainy season (October to February), and can last to up to 2 weeks (14 days). Calanthe vestita orchids are found in Myanmar, Vietnam, lower Thailand, Malaysia, Sumatra, Kalimantan and Sulawesi in forests on limestone in hill forests at sea level up to 1000 meters. Calanthe vestita relatively easy to maintain, making it suitable for beginner orchid collectors to keep. For the media, we can use ferns root, charcoal, moss, or a combination of the three.